Once I had kids, everything was different. I became much more concerned about everything we ate and put on our skin. When it came to sunscreens, it became more difficult to decide on the best option because of the many and differing opinions out there. First, the sun is very important in producing Vitamin D and your skin should be exposed directly to the sun, without lotion, for at least 20 minutes a day to reap the benefits from those wonderful warm rays. (according to the Canadian Cancer Society) But many sources state how important it is to lather sun screen on your skin liberally the minute you step out the door, especially now because of the thinning ozone and the discovery than even one burn in childhood could lead to cancer down the road. So what is the best way to protect our skin? Does sunscreen really reduce rates of cancer? The Food and Drug Administration’s (FDA) draft sunscreen safety regulations say: “FDA is not aware of data demonstrating that sunscreen use alone helps prevent skin cancer.” (FDA 2007). So after reviewing some differing opinions and after reading the long list of ingredients in the ‘regular’ lotion out there, I began my search for natural alternatives. The Environmental Working Group’s Safe Cosmetics Database reveals many safe sunscreens. Recently, Badger was rated #1 out of 910 easily available products. Badger is considered a ‘Physical Barrier’ Sunscreen whereas many sunscreens on the market are considered ‘Chemical Barriers’. Physical Barrier Sunscreens create a protective film on the top of the skin’s surface that reflects the harmful ultraviolet rays of the sun before it can reach living tissue. 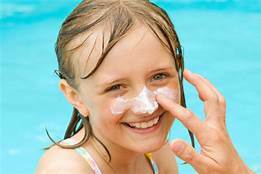 The two most common ingredients in physical barrier type sunblocks are zinc oxide or titanium dioxide. Zinc oxide is used in Badager’s suncreen because it was determined that it was the safest & most effective choice, and it has been used effectively and safely for hundreds of years. Or, make your own sunscreen. It really is simple. Another way to protect your skin is to increase the anti-oxidants you take in to counteract the free radicals that are generated by UV radiation. So start protecting your skin from the inside out by consuming high antioxidant foods like berries, broccoli, garlic, green tea, tomatoes, kidney beans, etc. Pull out those hats, full body bathing suits, sunglasses and cover up when the sun is at its strongest. In the early mornings and later in the day, its ok to go without sunscreen if your skin is used to the sun. So, don’t hide from the sun, there are many healthy choices out there. If you are interested in purchasing Badger Sunscreen, Balance Point Health Centre carries natural sun block. The following ingredients were purchased here. Optional: I love to add lavender essential oil to mine because it gives it a wonderful scent and is very beneficial to the skin. I also up the ante with Helichrysum essential for the additional SPF protection and anti-aging qualities of this fantastic oil. As me how you can get this for free! I typically add about 30 drops (total), after it is all mixed up and has cooled a bit. I only use therapeutic grade essential oils, so I am sure that the quality is to my standards (especially for use on my kids!). If you need help with this, join one of our workshops offered or call me to set up your own! 289-291-0254.